PHUKET: Officials at the Disaster Command Centre confirmed to The Phuket News today that Navy vessels and other boats are still searching for two fishermen who disappeared in the same storm that sank the Phoenix and Serenata tour boats last Thursday (July 5). 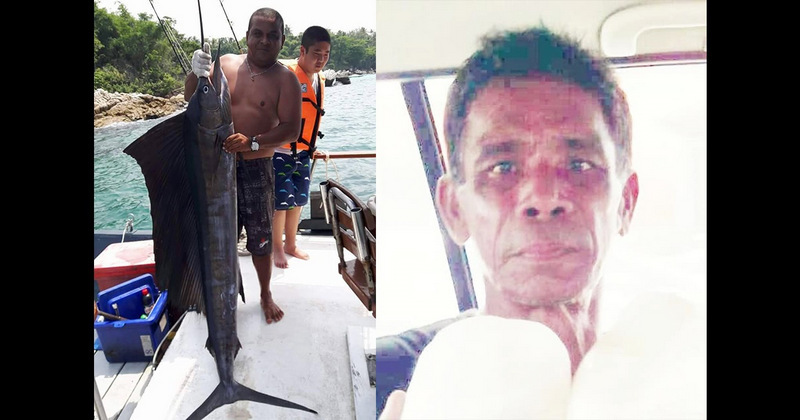 Prawit Salee, 59, and his friend Sakda Naopai*, 42, both villagers from Baan Bang Kontee in Rawai, put to sea in a longtail boat to catch fish between east of Koh Racha Yai, south of Phuket, that fateful day – but failed to return. Unable to contact Mr Prawit and Mr Sakda, concerned friends and relatives launched their own search by boats. Rawai Deputy Mayor Teerapong Thaodaeng joined in and enlisted the help of Nonthasak Marine to take a speedboat to join the search around Koh Racha Noi and Koh Racha Yai, where people had reported seeing the fishermen recently. However, after two full days of searching they found no sign of the two men, which prompted fellow Baan Bang Kontee villager Sarayut Salee to report the two men as missing to the Royal Thai Navy Third Area Command at 7:15am last Sunday (July 8). “Khun Prawit has been a fisherman all of his life,” his niece, Sasithorn Somboon, 53, told The Phuket News today (July 12). Ms Sasithorn was on Koh Racha Yai when the two men went fishing. “The storm came that day, but the relatives were not worried,” she said, adding that relatives thought that Mr Prawit and Mr Sakda might have landed safely ashore on one of the islands. “Other fishermen passed them at noon and they raised their hands and waved as usual,” she explained. “That night, people we know on Koh Racha said they thought that they (Prawit and Sakda) had both returned home, and we thought that they both landed on one of the Racha islands,” she said. “About two days later, we went to ask for help. Many navy officers and municipality officials joined the search every day for days, but we still found no sign of them,” Ms Sasithorn recalled. “Last night (July 11), we got a phone call from officers from the Navy Third Area Command who told us to bring documents and pictures Prawit and Sakda to give to officials for next stage of the search,” she said today. Meanwhile, two bodies recovered during the massive search operation to recover for bodies from the Phoenix disaster are waiting for DNA test confirmation in the hope of confirming their identities (see story here). Officials at the Phuket Public Health Office (PPHO) this afternoon told The Phuket News that those two bodies were not of Mr Prawit or Mr Sakda. * His official first name was later confirmed to be Saksri.